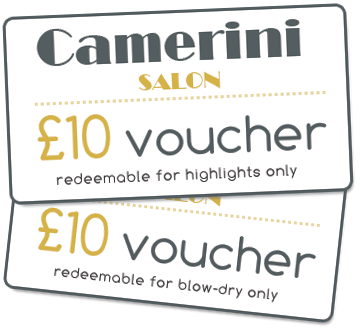 Your appointment at Camerini is reserved especially for you, we understand that sometimes schedule adjustments are necessary; therefore, we respectfully request at least 24 hours’ notice for cancellations. Please understand that when you forget or cancel your appointment without giving sufficient notice, we miss the opportunity to fill that appointment time, and clients on our waiting list miss the opportunity to receive services. Less than 12 hour notice will result in a charge equal to 50% of the services booked. “NO SHOWS” will be charged 100% of the services booked. Appointments made on the same day and needing cancellation, the client then must cancel within 4 hours of appointment time or will result in charge equal to 50% of the reserved service amount. Only under extreme circumstances, management may waiver the cancellation policy. The cancellation policy allows us the time to inform clients on our waiting list of any availability, as well as keeping the Camerini team members schedule filled, thus better serving everyone. Camerini policies are presented and provided in the best quality and tradition of excellent servicing for both our established and future clientele. Thank you for viewing and supporting our policies criteria. Please note Card Details and 50% deposit will be taken from New Clients to secure your appointment. Depending on your preferred method of communication as a courtesy, we will text/email and confirm your appointment one business day prior to your appointment date. However, if we are unable to reach you, and can only leave a message over , please understand that it is your responsibility to remember your appointment dates and times to avoid late arrivals, missed appointments and the cancellation fee. It is also your responsibility to inform us of any changes to your personal contact details. Please save our email address into your contacts address book; this will avoid your appointment confirmation emails potentially redirecting into a spam folder. Thank you for your loyalty and acknowledging this service.